Transcontinental and Western Air Flight 599 was a Fokker F.10 Trimotor en route from Kansas City, Missouri, to Los Angeles, California, on March 31, 1931. It crashed ten miles south of Cottonwood Falls, Kansas; all eight on board died. One of those killed was Knute Rockne, the head football coach at the University of Notre Dame, who was on his way to Los Angeles for the film "The Spirit of Notre Dame". It is often claimed that Flight 599 went down in or shortly after a thunderstorm. However, meteorological records show that there was no significant convective activity at the time. The accident was actually caused by the composition of the aircraft. Fokker Trimotors were manufactured out of wood laminate; in this instance, moisture had leaked into the interior of one wing over a period of time and had weakened the glue bonding the structural members (called struts or spars) that prevented the wing from fluttering in flight. One spar finally failed; the wing developed uncontrolled flutter and separated from the aircraft. Shortly after taking off from Kansas City, one of the aircraft's wing's separated in flight after penetrating a thunderstorm and experiencing strong turbulence and icing. The plane crashed into a wheat field. Wing-aileron flutter, brought about by moisture leaking into the wing's interior, weakening the glue that bonded the wooden spars. Notre Dame football coach, Knute Rockne, 43, killed. On 31 March 1931 Transcontinental and Western Airlines (TWA) flight 599 crashed near the town of Bazaar, KS while en route from Kansas City, MO to Los Angeles, CA. 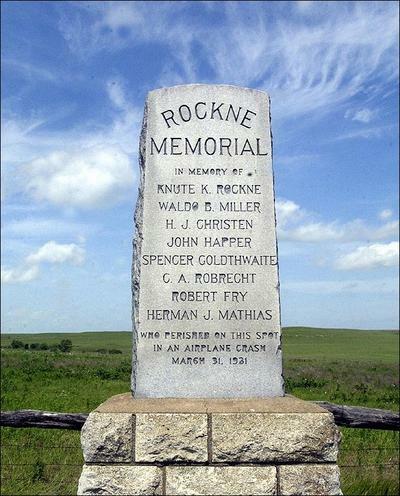 The downing of the Fokker Trimotor would have likely remained a historical “un-event” had it not been for the fact that legendary Notre Dame football coach Knute Rockne was numbered among the nine passengers and crew who died when the plane went down. Initially, authorities and aviation journalists speculated that the plane had come apart shortly after take-off owing to strong turbulence and icing produced by a thunderstorm. Further examination, however, revealed that this could not have been the case.